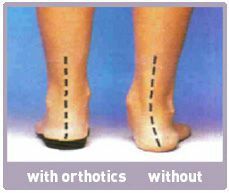 Orthotics are shoe inserts that correct an abnormal, or irregular, walking pattern. Generally called arch supports, orthotics allow people to stand, walk, and run more efficiently and comfortably. Podiatrists sometimes prescribe orthotic devices to correct an abnormal walk, or gait, and often for patients following surgery. ​Soft orthoses are usually effective for diabetic, arthritic, and deformed feet. ​Semi-rigid orthotics provide foot balance for walking or participating in sports. Sometimes, different sports call for different kinds of semi-rigid orthotics. The typical semi-rigid orthotic is made up of layers of soft material, reinforced with more rigid materials. ​Children are sometimes given orthoses to treat flatfoot or in-toeing or out-toeing disorders. Athletes often are given orthoses to mitigate pain while they train and compete. ​While over-the-counter orthotic inserts help people with mild symptoms, they normally cannot correct the wide range of symptoms that prescription foot orthoses can since they are made to fit a person with an "average" foot shape.